Here is another huge, messy genus with species-level taxonomy in a shambles, at least in some parts of North America. Almost all the species feed on Asteraceae and are monoecious. I actually published a short paper with some co-authors on one common species with a very wide host range, Uroleucon (Lambersius) erigeronensis (Thomas). Uroleucon (Lambersius) erigeronensis alate from the east slope of the Cascade Range in Washington. Jensen A.S., G.L. Miller, A. Carmichael. 2010. Host range and biology of Uroleucon (Lambersius) erigeronense (Thomas 1878), and its synonymy with Uroleucon (Lambersius) escalantii (Knowlton 1928) (Hemiptera: Aphididae). Proceedings of the Entomological Society of Washington 112: 239‑245. Since then I continue to collect Uroleucon in the west, especially focusing on the subgenus Lambersius. A few years ago I found an impossibly small U. (Lambersius) in the mountains near here, but the season was so late that I could not identify the plant at all. Finally in 2018 I was able to collect this aphid again on its host plant while in bloom. Turns out the host is Aster integrifolius in sage brush steppe at high elevations. 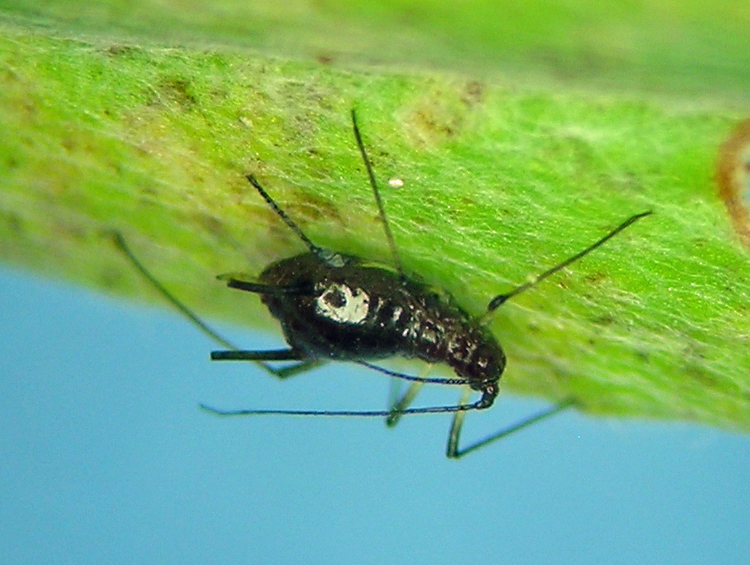 This aphid is very small, a strange mottled pale green, and has Macrosiphum-like siphunculi, but is probably most related to some other species placed in U. (Lambersius). Another interesting 2018 find was a bright yellow species feeding among the flowers of goldenrod along a forest roadside in southern Oregon. The interesting thing about this was that it was tended by ants! 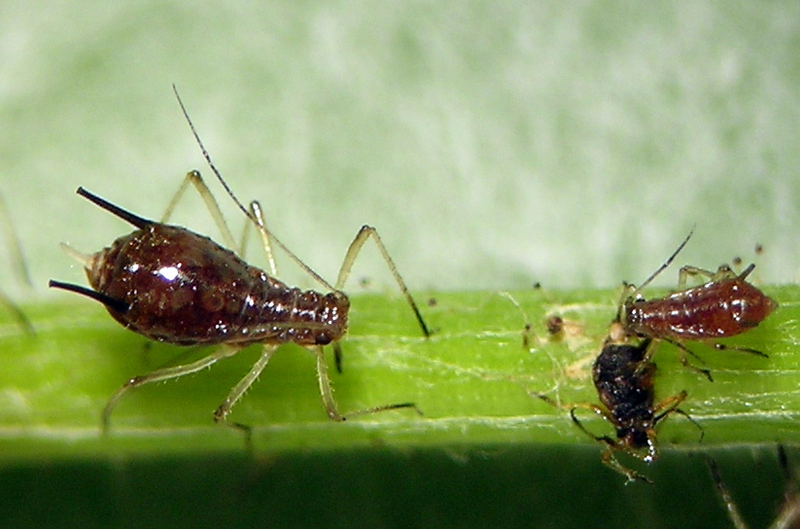 Aphids shaped like Uroleucon are very rarely ant-tended (ant tending is correlated with short appendages and cauda). 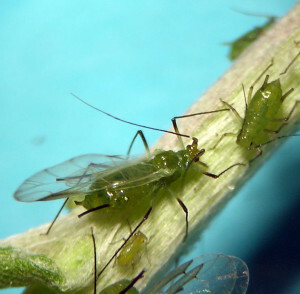 In the northwest of North America there is a plant called Adenocaulon bicolor, or ‘trail plant.’ There is a host-specific aphid that lives on it called Uroleucon adenocaulonae. 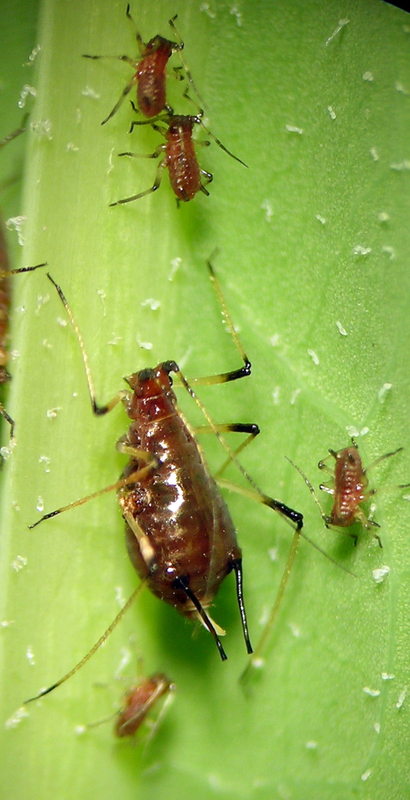 Like many aphids, I have an affection for this species, partly due to its wonderful forest habitat and partly due to its bizarre posture in life, facing head down on the plant stems but with the back legs and body dangling, almost making the insect look dead. I have viviparous females, oviparae, and apterous males. So far I have samples from Oregon, Washington, and Idaho. Uroleucon adenocaulonae aptera from the Cascade Range of Washington. This species is native to western North America where it feeds on native species of Stephanomeria, an unusual xeric-adapted plant of sagebrush and salt-bush steppe. A plant that is superficially similar is the invasive rush-skeleton weed. The question mark on the subgenus is taken from Blackman and Eastop, and is probably because this species seems not particularly closely related to most other U. (Uromelan). I have seen it quite a few times now on what are almost certainly at least two species of Stephanomeria; samples in my collection are from Washington, Oregon, Arizona, and New Mexico. Uroleucon bonitum from central Washington in July. This is a common European species that feeds on Canada thistle, Cirsium arvense, especially west of the Cascade Mountains in western North America. I have collected it in Washington and Oregon and confess to walking past quite a few possible collections due to it being a European invasive. Uroleucon cirsii from Orcas Island in Puget Sound of Washington. 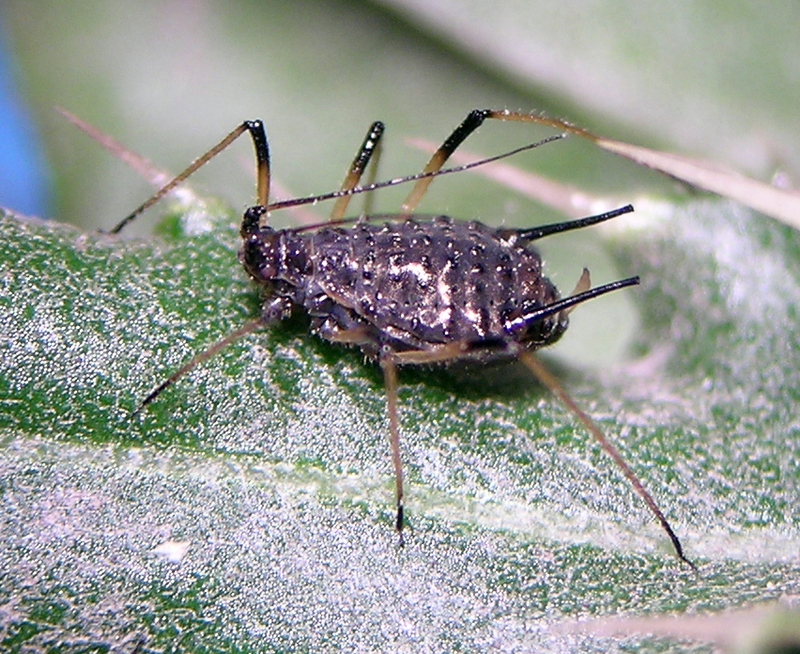 This is another of my favorite aphid species, simply because it took me so long to find it. When Knowlton described it in 1947, he had seen it and received samples from many places in the Rocky Mountains where it was collected in people’s yards on ornamental hollyhock (Alcea rosea – a native of China). For over 20 years I have looked with interest at every hollyhock I see, thinking surely this aphid must be found some day, or Knowlton had somehow been wrong about the host. In 2010 I collected a dark red aphid in the Blue Mountains of Oregon that in terms of genus placement looked like Macrosiphum more than it looked like Uroleucon when mounted on slides. Yet, certain characters forced me to consider it as likely Uroleucon. At the time, I thought the host plant was a Geranium, leaving me at a dead end on species identification. 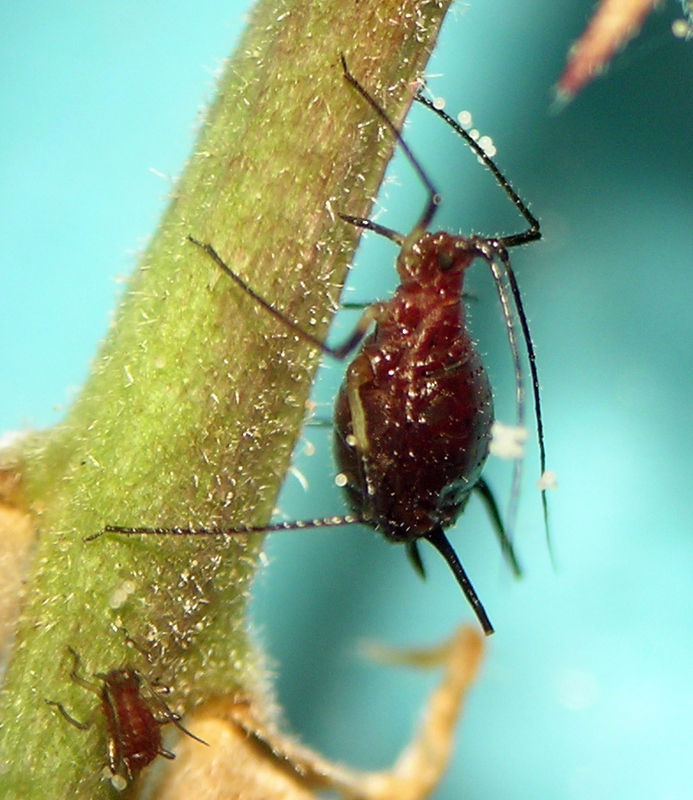 The second time I found this aphid, I decided to collect the plant and make sure it was really a Geranium. Turns out it was a Sidalcea (checker mallow), the same family as ornamental hollyhock (Malvaceae). This put me onto the true species identification, Uroleucon eoessigi. Since then I have seen this species here and there on Sidalcea and in one season it was incredibly abundant on Iliamna, a wild hollyhock locally common in the mountains near Boise, Idaho. Like many aphid species, this one seems to go through many seasons of being very rare, with an occasional season of overwhelming abundance. 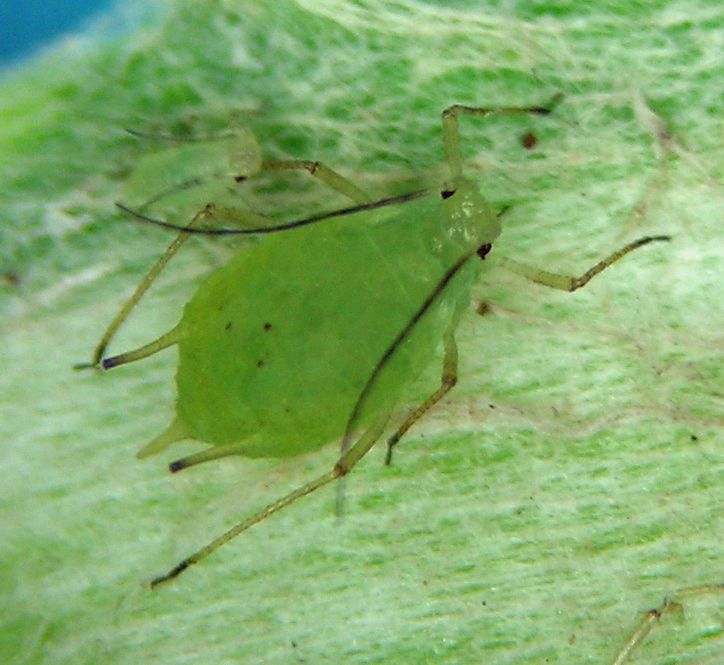 The 2016 season in southern Oregon near Lakeview was another strong one for this aphid — it was on Sidalcea almost everywhere we went from early spring through leaf drop in late September. The question mark above attached to the subgenus name is copied from what Blackman and Eastop did — I assume they had the same concerns about generic affiliation that I have. So far I have specimens from Oregon and Idaho. Uroleucon eoessigi from Iliamna in Idaho. As I noted above, this is the species of Uroleucon I’ve actually published on. I noticed early on in my aphid studies that Uroleucon (Lambersius) seemed to feed on many different species of Asteraceae in the Northwestern U.S., and that almost all of them keyed out to U. erigeronensis. The fundatrix of U. erigeronensis on Ericameria. For many years I thought that small differences in morphology that I saw might indicate that there were many different, host specific species involved. 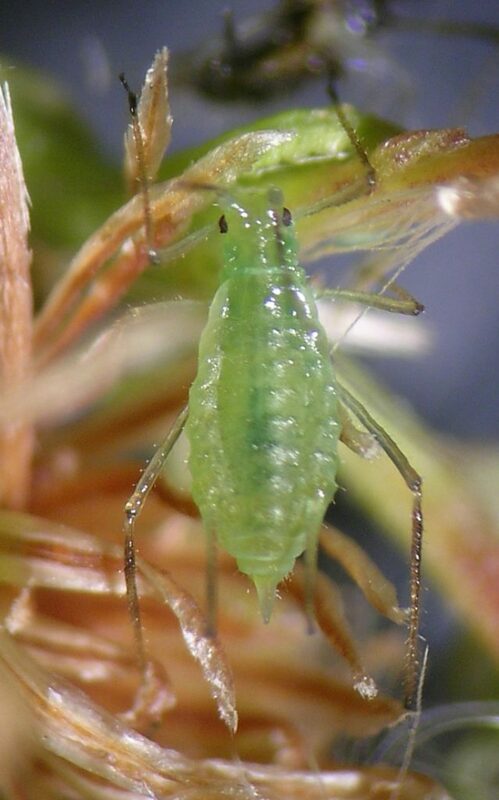 In the 2000s, however, I studied this aphid in the sagebrush steppe of central Washington and saw clearly that all these slight variations in morphology did not relate to separate species. 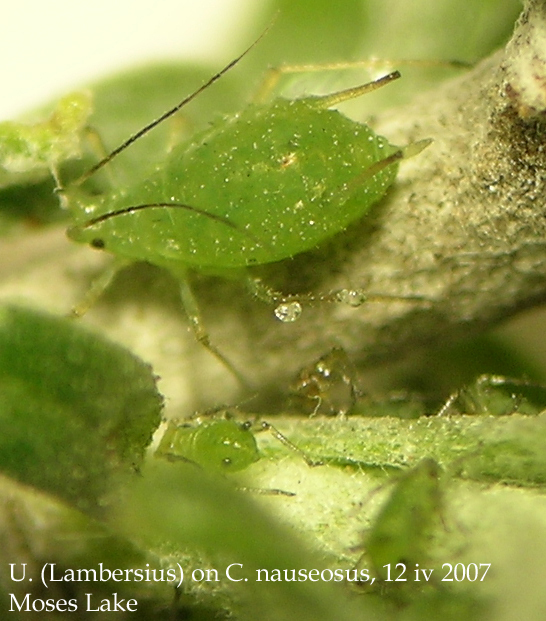 I remember one decisive collecting day in the Potholes Revervoir area: I saw this aphid in great numbers on several plants in the same locality, including the rabbitbrush shrubs, Crepis, and more. Since then I have seen that it often enters winter as eggs on the skeletons of late-blooming plants like Conyza canadensis or Ericameria nauseosus, but might actually get going with spring development on more ephemeral herbs that I tend to lump in genera such as Aster, Erigeron, Crepis, and Hieracium (to name a few). In the steppe around my central Washington home, this species would move from species to species as they bloomed and senesced, eventually finishing the season once again on Conyza and Ericameria. 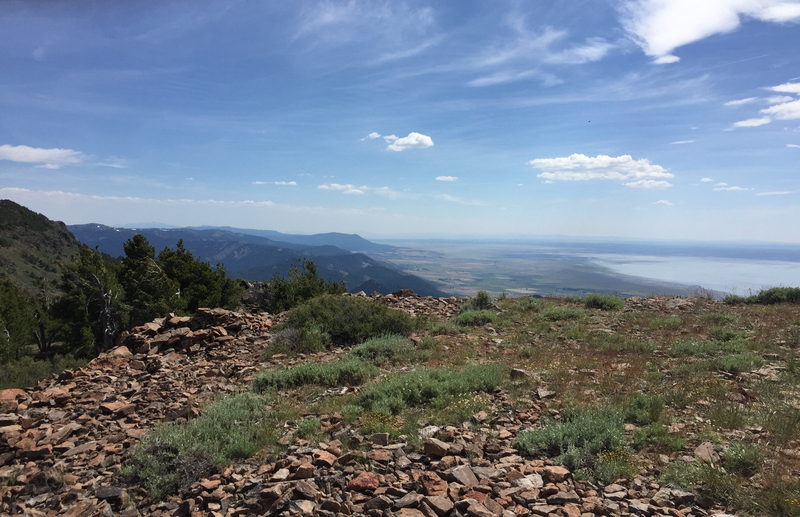 The mountain-top flora of Crane Mountain, Oregon. The small yellow flowers in the foreground were beset with recently colonized U. erigeronensis. 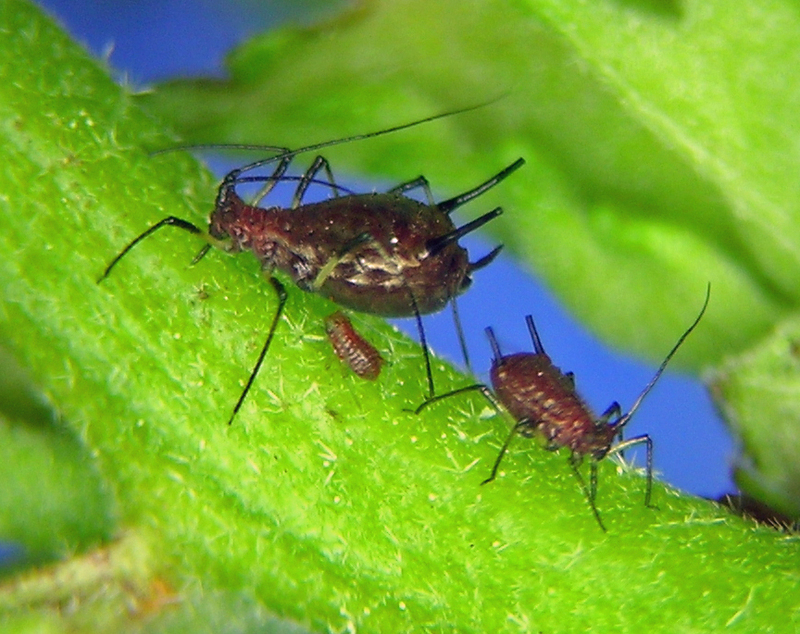 migrate from lower elevations each season to colonize these resources that otherwise would not be available to aphids. I have collected this aphid hundreds of times, and walked by many hundreds more possible collections. The list of genera I have recorded it from is very long, and would be longer were I better taxonomist of Asteraceae. To see a list of plants I’ve recorded this aphid from, see my collection database. Uroleucon (L.) erigeronensis on Stephanomeria in central Washington. Uroleucon (L.) erigeronensis ovipara on Conyza canadensis in central Washington. This is a species that feeds on native thistles (Cirsium spp.) in western North America. Like many aphid species, a person can look at hundreds of native thistle plants between finds of this aphid. It is easy to recognize by its host plant choice and its very long ultimate rostral segment. I was lucky enough to find the fundatrix of this species while clambering down a rocky trail in central Washington in April. I have samples from Washington, Oregon, New Mexico, and Arizona. Uroleucon longirostre fundatrix from central Washington. Another of the few native Uroleucon species that is widespread and somewhat common in western North America, this species feeds on the common composite Anaphalis, and is distributed across much of northern North America. I have material from the mountains of British Columbia, Washington, Oregon, Idaho, and Quebec. Uroleucon russellae from the Eagle Cap Mountains of Oregon. 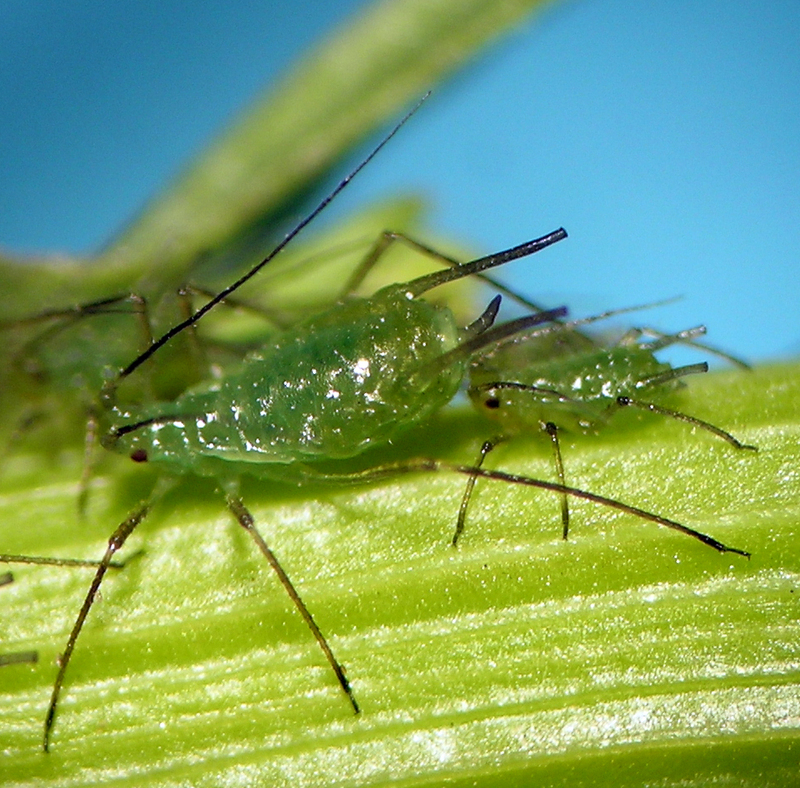 This is one of the more common and easily noticed aphids on the planet. And, it now lives in most parts of the planet. It lives mostly on Sonchus (i.e. sowthistles), but I have collected on cultivated lettuce as well in a mixed assemblage with Macrosiphum euphorbiae. I have specimens from Washington, Oregon, Colorado, Wyoming, and Germany. But, like many common aphids, I often walk by this one without collecting it. Uroleucon sonchi from eastern Oregon in June.